A recent report on Trades Academies is pretty luke warm in its assessment of their success in terms of retention and progression. A key methodological feature is the comparison between the group of participants and a comparison group of students which are matched to them. I have a hesitation about one aspect of the matching and that is the use of “disengaged” with its particular definition. In my view, you cannot be a “little bit disengaged” – not any more than a US student can “drop out of school a little bit”. In New Zealand the word “disengaged” has become our way of describing what the educators in the USA call “drop-outs”, the Pacific calls “early school leavers”, the French call “abandonnant l’école”, the Finnish “avhopp från skolan”and the Chinese “辍学. Everyone knows what it means and agrees that it is a bad thing! If we accept that “disengagement” has come to mean what “drop-out” means in the USA, to start using it to include such episodes as stand-downs and suspensions and truancy is to water it down and this is a great pity because “disengagement” in the sense of having disconnected from a school is a very serious and damaging thing. I have developed and use a taxonomy of disengagement that notes three kinds of disengagement. The student is at school but nothing to speak of is happening in terms of learning – poor or no positive outcomes are likely. In this category, disengagement is delayed and occurs when a learner achieves to some degree but has a basket of credits that are not robust enough (or perhaps even the right credits) to sustain further study. But none of these categories admit those who are stood down / suspended in themselves or even serious truants on the grounds that many well-behaved and, indeed, capable and successful students are likely to be and are included in each of these categories. Selective truancy is a deliberate tactic used by many students especially in the senior years and might best be described as tactical attendance. One hopes that the other matching criteria dulled the impact of engagement as a matching tool. The other issue I have with the report is not the fault of the researcher. To include the MIT Tertiary High School into the group generically described as “trades academies” is misleading and inaccurate – it just doesn’t fit there. Yes, it is a secondary / tertiary programme but there are key differences that mark it as unlike any of the trades academies. Its target student group is distinctive. The merged nature of secondary and tertiary curricula is totally different in that secondary and tertiary programme components are not consigned to different days nor to different locations both of which are features of the traditional trades academy model. The location of the programme is completely and wholly in a tertiary setting – the students are expected to act as tertiary students, all day every day. Finally, The MIT Tertiary School is a four-year programme and not the 38 day programme that Trades Academies are able to offer within the time allocation given to trades academies. And there is another difference – this targeted group of students achieve both high levels of NCEA and technical qualifications within the programme that can take them into many higher level qualifications including degree level study. 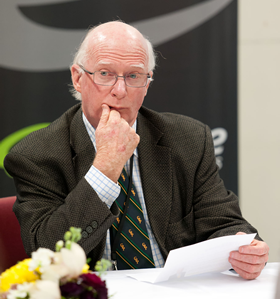 NZQA reports the 2014 NCEA results as Level 1 – 100%, Level 2 – 91.8%, Level 3 – 83.3%. What a pity that such stunning success is not reflected in a study of trades academies. Hon Steven Joyce got it right when, in response to the report, he noted that it was early days and that it was difficult to get good data. Make no mistake about it, trades academies are already demonstrating an ability to excite students about learning and to open up for many, pathways to success that the conventional school programme is unable to do. Time will show that early access to technical and vocational programmes is a key to success for a significant proportion of students. This research report does show an emerging trend towards increased retention despite its rather coy conclusions and there can be confidence that an impact on successful outcomes will follow.